Behold, “Frankenstein’s Monster”, the gruesome anti-hero from “The Bride of Frankenstein” hailed by critics as arguably the best of the “Frankenstein” series. The rare sequel that outshines the original. Portrayed by Boris Karloff, and credited singularly as “KARLOFF”... above the title, a statement to the star power he had gained since the original. Karloff put in an inspired performance, adding a subtlety and depth to the character. Even Universal’s make-up artist, Jack Pierce, expanded on the character by creating a more complex and detailed appearance, designed to show the damage from the mill fire at the end of the previous film. An ambitious film from start to finish that truly delivers, cementing the character firmly in place at the top of not only the horror genre, but all of cinema history and ushering in a new world of gods and monsters. 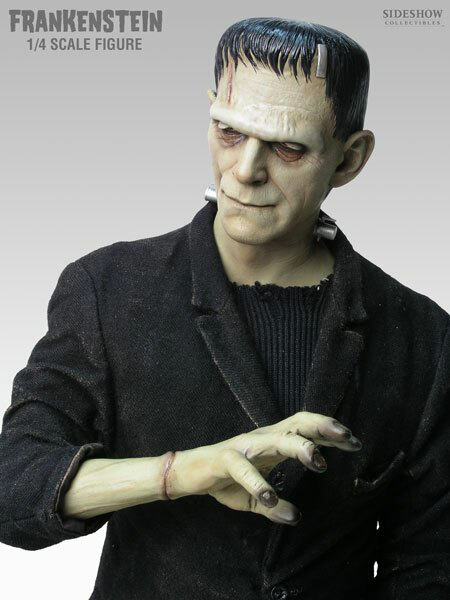 It is a perfect night for mystery and horror as Frankenstein’s monster rises once again and lumbers forth from the dark depths of the Sideshow Collectibles laboratory, where the air itself is filled with monsters. Along with Universal Monsters, we defy nature and breath life into the unliving, sculpting together a modern prometheus in this macabre 1/4 scale recreation of “The Monster”. Based on Boris Karloff’s version in “The Bride of Frankenstein”, he is painstakingly hand crafted down to the most intricate of details, from the wrinkles on his massive brow and hands, to the scarring along the side of his face. Standing atop a sturdy cobblestone textured base and featuring a weathered fabric outfit, tattered and damaged. You absolutely must give this sad, misunderstood creature a home. Alone... bad. Friend... good! Invincible Studios is an art and design studio owned and operated by Christopher Higginson. All artwork is copyright Christopher Higginson or it's respective owners and cannot be used without express written consent.